There’s a part near the end of John Collins’ excellent documentary on West African rhythm, Listening To The Silence: African Cross-Rhythms, where Collins makes a striking observation. African music, he says, is like a perceptual time bomb that went off inside Western music in the twentieth century. Indirectly shaping jazz, rock, pop, hip hop and even classical music, the influence of African music is omnipresent in the importance of steady groove, syncopation, and polyrhythm. Most of us hardly ever think about it, but much of the music we hear around us is indebted to the aesthetics and vitality of African–especially West African–music making. 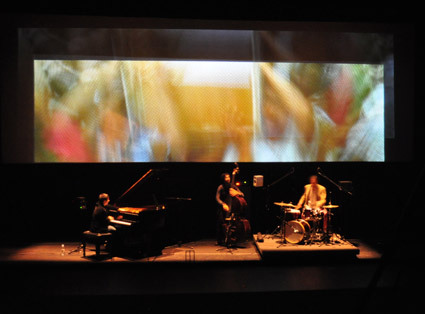 I thought about Collins’ documentary when I came across the music of Dawn of Midi, an acoustic piano, bass, and drums trio from Brooklyn. Dawn Of Midi’s most recent recording, Dysnomia, is a compelling 45-minute long, through composed musical object. Each of the album’s nine tracks–which connect to one another into a single seamless groove–is a study in making polyrhythm and rhythmic process front and center in the music. The tracks have little in the way of jazz chords, chord changes, or melodies. But what it lacks in that department it makes up for in rhythmic vitality executed with precision timing, focus, and verve. You can hear this vitality on the track eight, “Algol.” Pianist Amino Belyamani plays African bell-like timeline patterns on muted strings rich with harmonics; bassist Aakaash Israni plays staccato two-note chords; and percussionist Qasim Naqvi finds the silences in between the bass and piano parts and inserts bass drum, hi hat, snare, and cross stick hits. Each musician’s part repeats but also steadily shifts, adding and subtracting notes to keep the musical texture evolving. A lot of skill and restraint is required to pull this off as well as Dawn of Midi does. Perhaps most significantly, “Algol” has a twelve beat meter. Meters like 6/8 and 12/8 are common in West African drumming pieces, perhaps because they facilitate multiple musical time perspectives. For instance, 12/8 can be felt in groups of 2, 3, 4, or 6 beats. Skilled musicians can play patterns within the twelve counts of the meter that foreground these different metric subdivisions of 2, 3, 4, and 6 beat groupings. Musicians can also superimpose these different groupings–playing say, a three beat pattern in the left hand and a two beat pattern in the right to make a polyrhythm (or what Collins’ documentary calls a “cross-rhythm”). Dawn of Midi does a lot of this kind of foregrounding metrical foreground and background in their music by having each musician repeat specific patterns that interlock in ways that engage and surprise the listener. Each pattern holds steady for a while, then makes a subtle change. And with every subtle change, a new musical relationship is revealed. Between the patterns, the repetition, and the perceptual delights to which the subtle changes give rise, this music holds your attention like a kaleidoscope. There is so much that is interesting about Dysnomia. First, the African music connection is real: these musicians know how to construct polyrhythmic grooves that circle around a shared beat without articulating it outright, and this tension makes the music fly. Second, the music flies yet also doesn’t go anywhere harmonically or melodically–and this is a good thing, if only to remind us of the power of rhythm and timbre to hold our attention. Third, the electronic music connection is just as real as the African one. Structurally, the aesthetic guiding the pieces on Dysnomia resembles the constraints of a step sequencer that allows musical parts to only shift one note or “step” at a time. It’s perhaps a rigid musical protocol to adopt, but it nevertheless lends this acoustic music an electronic feel. Also, great restraint and control are required to play and develop parts as a machine like a step sequencer can. In this way, Disnomia has a disciplined and focused sound “with a pull all its own” (says Chris Barton, L.A. Times) that evokes an “organic quest for something spiritual and transformative” (says Jeremy D. Larson, pitchfork.com). Like a true African cross-rhythm, the music seems to never quite reveal itself, and so we wait to hear what will happen next.